Sometimes, there is really no reason to try and be original. It can be very nice to just make something which is very typical for an era in fashion that you like or even for your own 'signature look'. 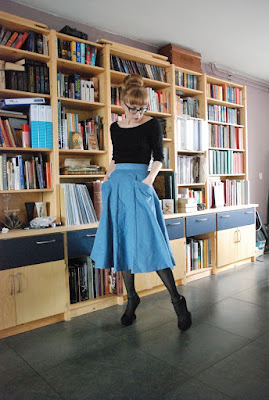 I think this skirt is like that. 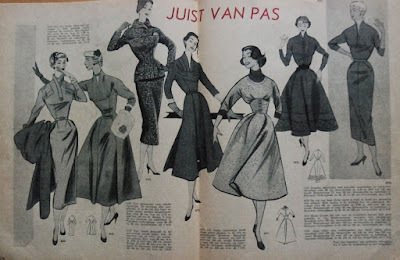 The shape, a half circle, would not have looked out of place in the early 1950's (when high fabric cost kept hems in everyday life narrower than you'd expect by looking at the couture creations of the time). 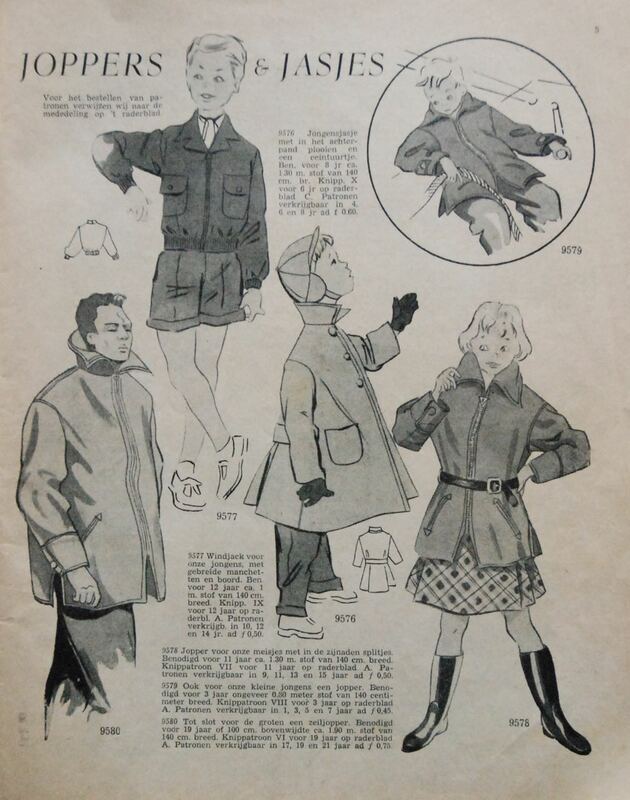 The pockets, with their folded-back flaps suit that style too. And personally, I've always loved half-circle skirts. Nicely full but more economical and a lot more practical than their full-circle relatives. 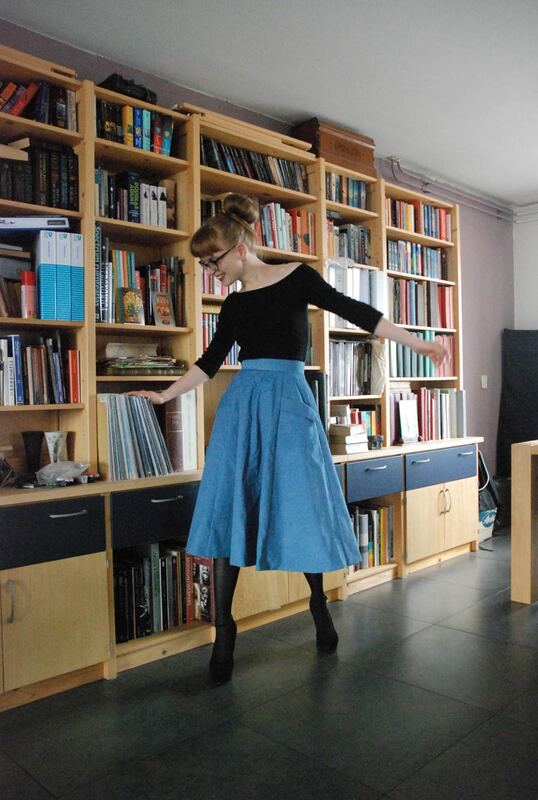 For example, riding a bicycle in a half-circle skirt is fine. 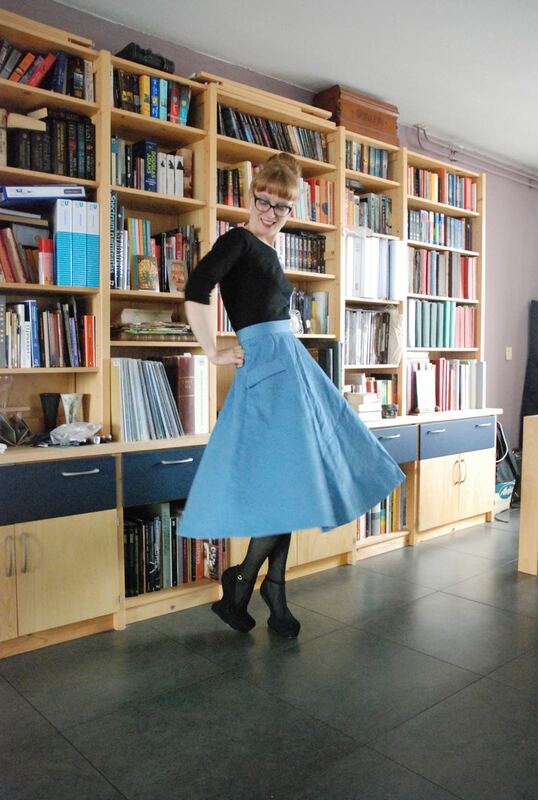 The only special thing about this skirt has to be the fabric: A mid-weight, fairly stiff corduroy in a lovely sky-blue colour. Although the pile of this particular corduroy is really low, I treated it as a "fabric with nap" anyway. I cut the skirt in eight gores which were all cut out of the fabric in the same direction. Of course, this way to cut the skirt also made this pocket design possible. There is not much more to say about it really... It's a fun skirt which will work well with lots of different tops. This past month, I have been sewing and I have enjoyed it... It just took me a long time to take pictures of what I had made. I finally caught up. Today, E took pictures of three different new garments. Actually, four new garments but two of those are in the same outfit. That's the one I will show you today. I've had this heavy mystery-fiber (definitely synthetic but luckily without static cling) crepe in my stash for a while. Originally, I had it earmarked for a dress with elaborate draped and pleated details but I never quite got around to making it. I think I was right not to. This stuff is too bulky for such use. 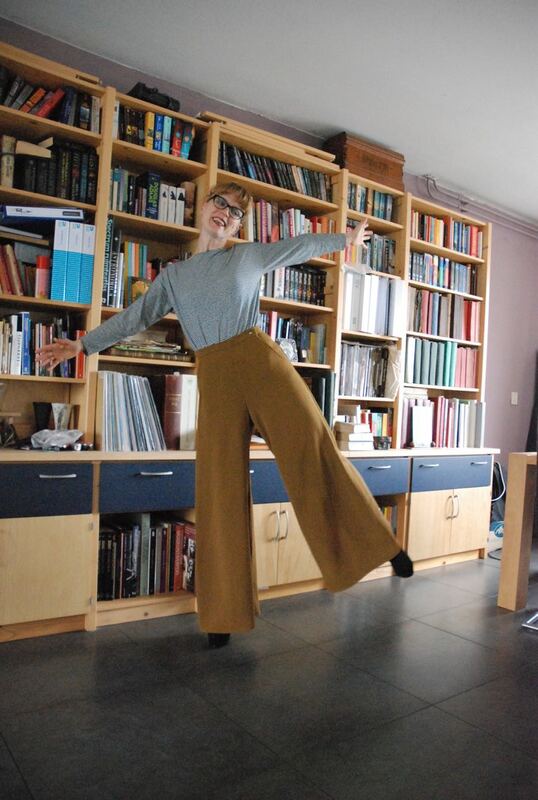 So, some weeks ago, I decided to make something else I liked the idea of: Retro-style very wide trousers. I always liked the idea of culottes/trousers and I have made a pair before. And now that my increased level of exercise (all that climbing!) has made me loose some of the roundness on my hips, they look even better than before. So, I thought that would be a great use for that fabric. And did I mention I love the colour? That bronze-ish tone tends to look very good on me and it can be combined with so many other colours I like! The previous pair of full-length culottes were drafted as culottes, based on a skirt sloper. 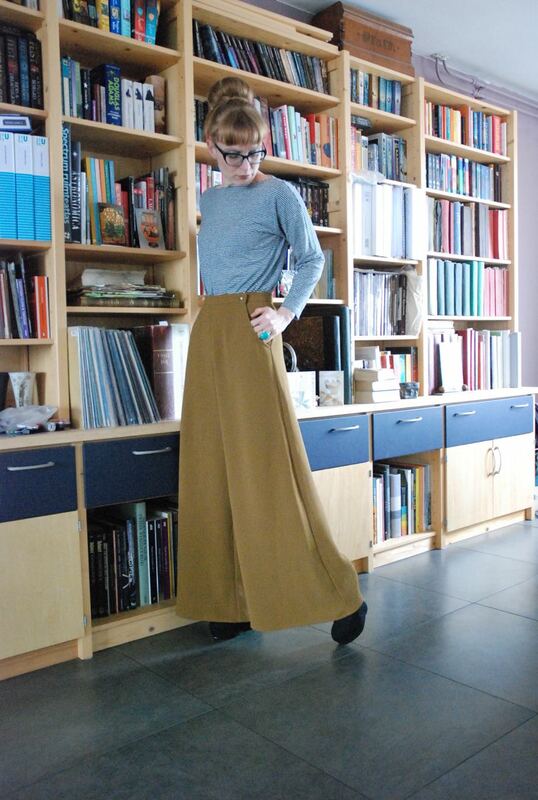 This new pair isn't, these are actually very wide trousers. The only real difference is in the shaping of the crotch seam and in the angle of the center back seam. I also made a better informed choice about the pockets: The old pair had in-seam pockets. Not the best choice in a garment that is at its most fitted from waist to hip. Here, I have made slightly curved slanted pockets. Oh, and I didn't want to make a fly front in a fabric with so much drape. Nor put a zipper a the side seam, come to think of it. 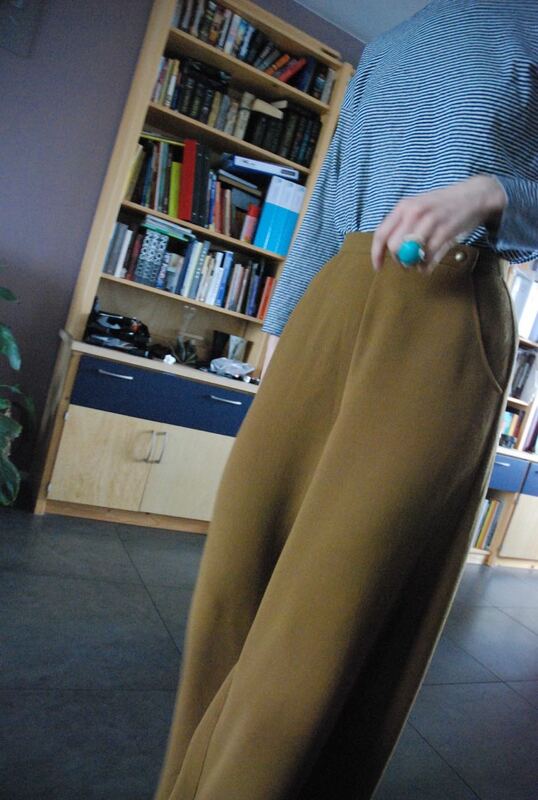 So, the closure of these trousers is another of my odd zipper-less inventions. There is a button on the waistband at the left pocket, not a the right side. The inside of the left pocket extends to center front and is buttoned to the inside of the waistband there. So, the trousers open far enough through the side of that pocket for me to get in and out of them. 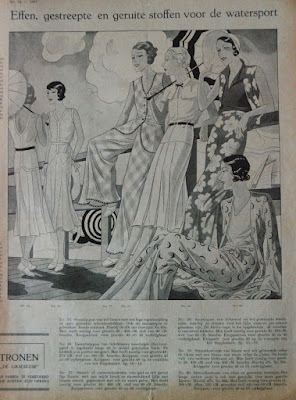 or these from Gracieuse magazine from 1931. Oh, and I also made the top (this is not a great picture, E took it while I was putting on my shoes. It looks a bit odd but it does show my work with those stripes). 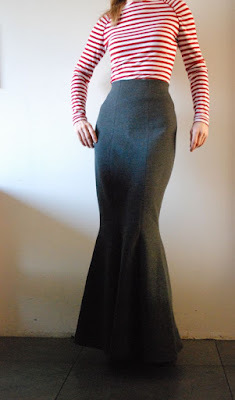 I used the loose fitting, dropped shoulder shape I made earlier this winter and tried my best at matching those very thin wavy stripes (and gave up on that half-way through). It's simple and comfortable and in this thin jersey, it is perfect for tucking into high waistbands. It's been a while since I shared any vintage goodness here. How could I forget to do that! I'll try to make it up to you. 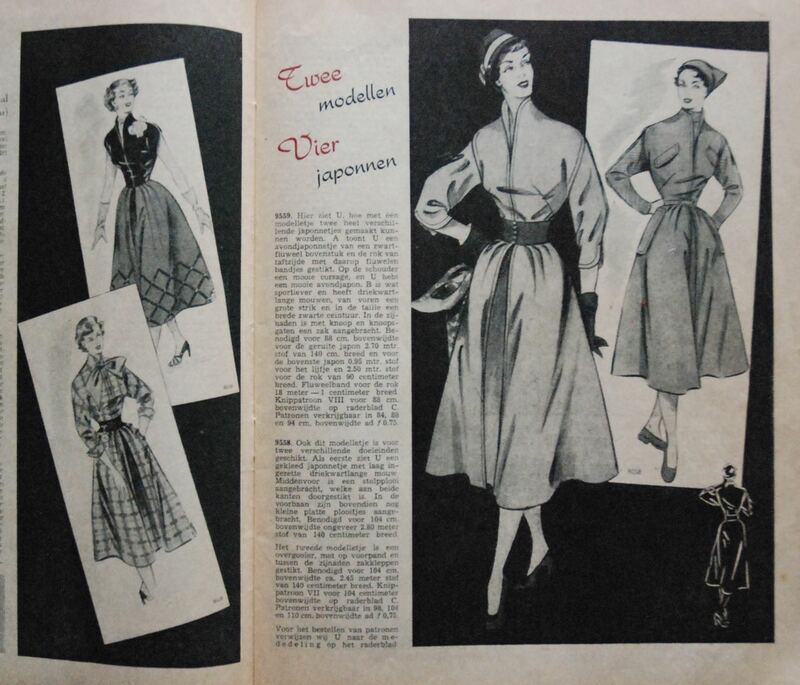 Today, I am happy to present an issue of one of my favorite Dutch sewing magazines: Bella, het nieuwe modeblad (= Bella, the new fashion magazine). Bella is a favorite of mine because, unlike many other magazines of the time, it includes all the designs which are printed in the magazine on the pattern sheet. 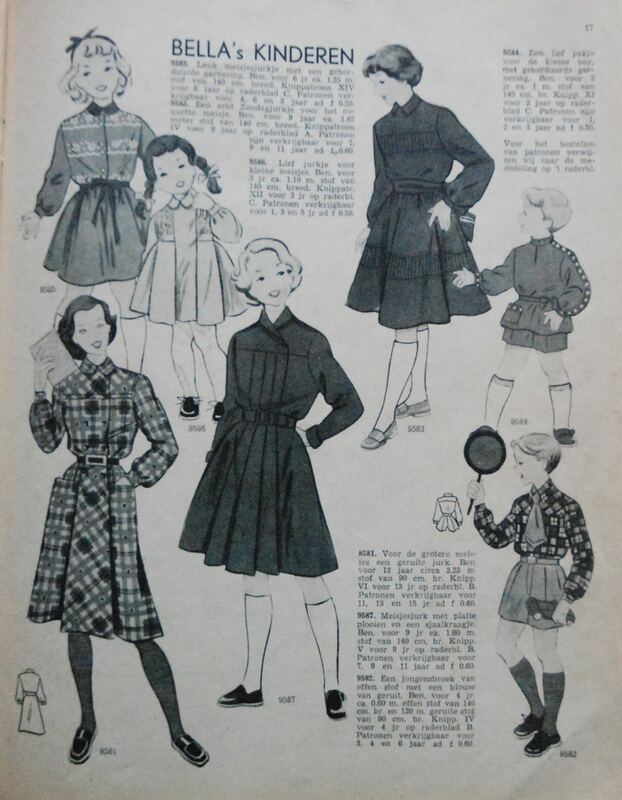 Just in one size each though (I have yet to find multi-size printed patterns pre-dating the mid-1960's). 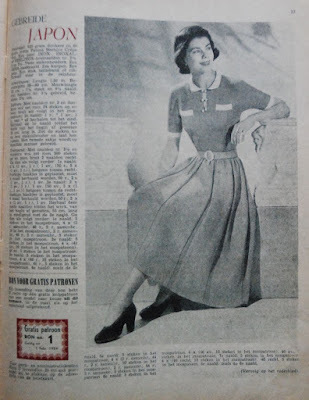 This is the first (of two) January issue of 1954. 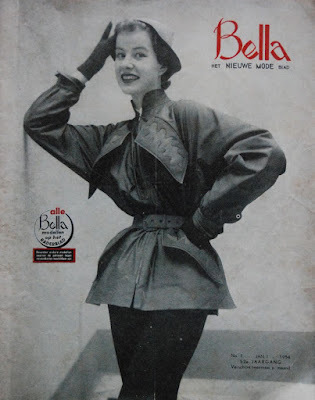 I'm not sure this coat with the crazy chest pockets is a Bella design. The covers of Marion always showcase designs readers could make for themselves but Bella is a bit inconsistent with that. On the reverse of the cover, we have this "big sister, little sister" feature. The looks for the big sister are in small(ish) lady's sizes. 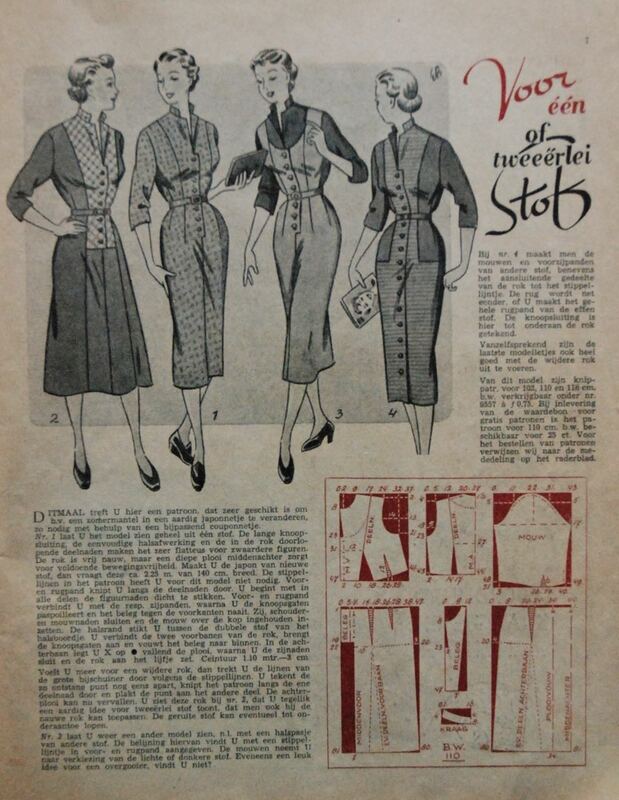 and this issue's "four variations to draft from these instructions" feature (I once made a blouse using one of these. It worked way better than I had expected. You can see the blouse itself here. 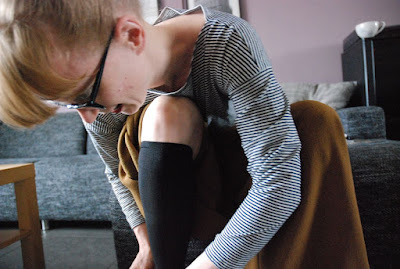 I shared the pattern for it in this post and another one, a dress in a larger size, here). If you are wondering if there is something wrong with the illustration because the skirt on the dress on the left seems wider than the other ones, there isn't. This pattern includes instructions to turn the skirt form sort-of-pencil to A-line. This is another "one pattern" two options feature. It includes two patterns for what is basically the same design in different sizes. 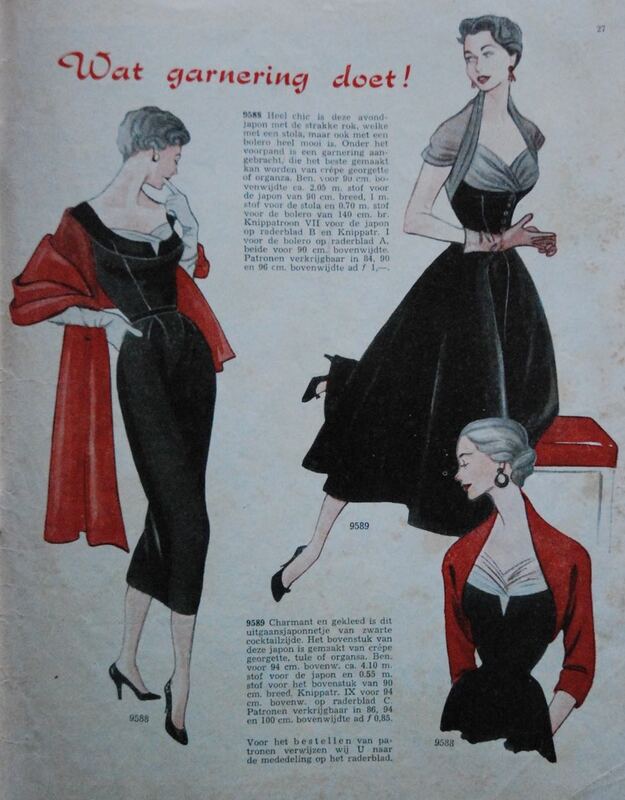 They both have a dropped shoulder which can be used on its own or with an added three-quarter length sleeve. This spread includes some of the most interesting designs in this issue. 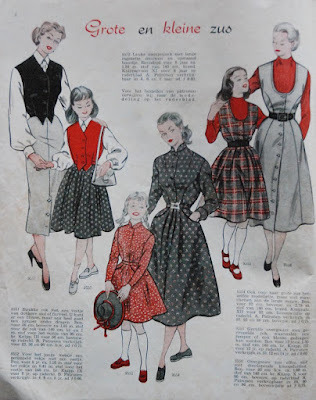 You may even have seen it before because I tried out one of these patterns for last year's Vintage Sewing Pattern Pledge. The toile I made of the second dress from the left is still on the dummy in my sewing room. I still don't really know what to do with it. 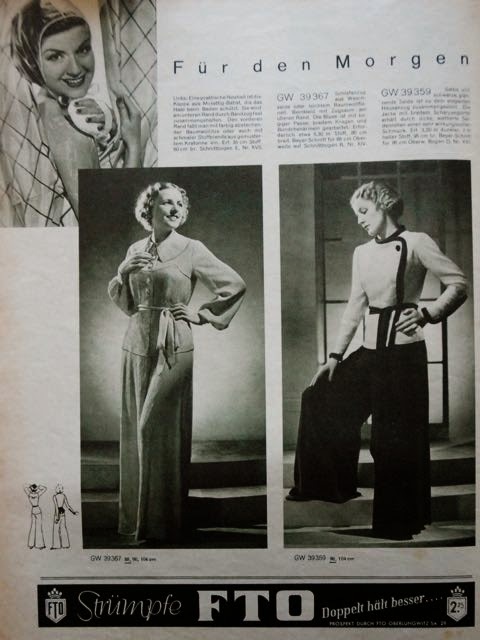 I've just never been able to decide on the right fabric for it. and the inevitable nightwear. 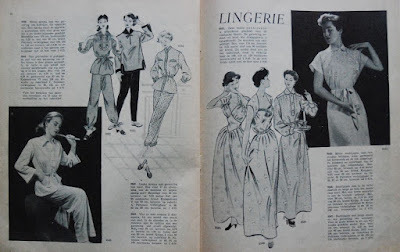 Really, it never ceases to amaze me just how often all these vintage magazines feature "lingerie", by which they usually mean pyjama's and nightgowns. Maybe I should try one of these designs some day but... meh. There are so many more interesting things to sew. And then there is a knitting pattern. And quite a serious one at that. A whole dress, with a full-ish skirt. Did anyone ever really make one of these? 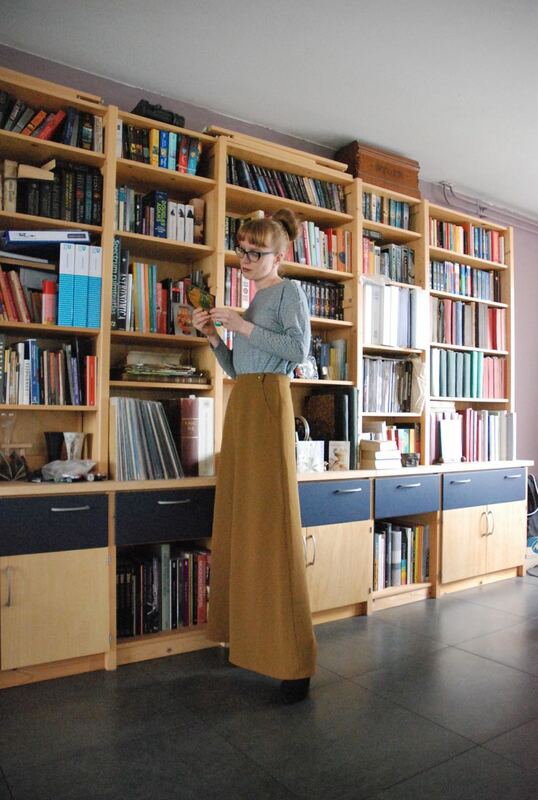 It must take forever to knit and surely that skirt would be quite heavy... I really should ask my grandmother. And after that, on the inside of the back cover, there are the most glamorous designs: Two cocktail dresses with a stole and a bolero. They are supposed to be made from silk with details in georgette, organza or tule. It's a proper mermaid skirt! 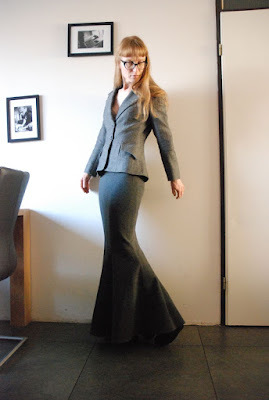 It has been a loooong time since I tried this look but this particular fabric, a beefy, polyester/wool/viscose/lycra ponte knit, was just asking for it! It drafted as a six panel skirt but I added a center back seam for fabric economy. I started out with the same shaping on all the panels (just more flare and a bit more length towards the back) but ended up taking it in at the side waist and at all the back leg seams between hip and knee. 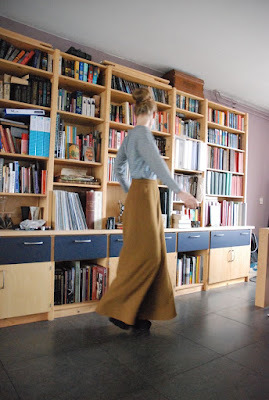 This skirt actually tapers significantly towards the knee and only flares out from there. I would never do this in a woven fabric but this is a knit, it has stretch so something approaching a true "Morticia"-look is possible. Drafting a pattern like this is fairly simple. I didn't use any instructions (I know how to do stuff like this by now) but you could try out different ways of drafting a skirt like this using this tutorial from Studio Faro. 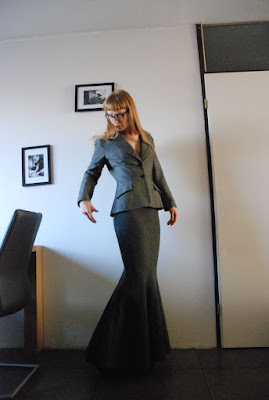 I haven't really worn the skirt yet but I when I tried it on with this tweed jacket which I made many years ago, I just loved the look!